Saint Peter Robotics FRC- Team 3018 ‘Nordic Storm’ and winning alliance partners at the 2016 MN 10,000 Lakes Regional. “The varsity Sport for the Mind™”, FRC (FIRST® Robotics Competition) combines the excitement of sport with the rigors of science and technology. Under strict rules, limited resources, and time limits, teams are challenged to raise funds, design a team “brand,” hone teamwork skills, and build and program robots to perform prescribed tasks against a field of competitors. It’s as close to “real-world engineering” as a student can get. Parent involvement: Teams are led by mentors who include parents and community members with typically who provide guidance as professional engineers, programmers, and precision machining/fabrication specialist. 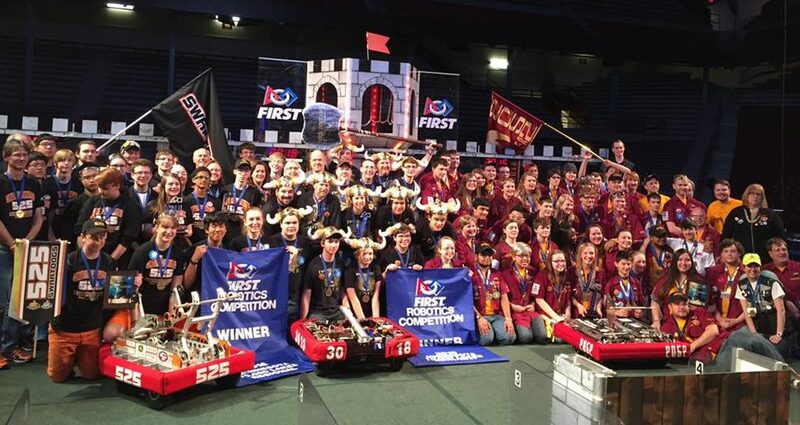 Parents are strongly encouraged to be active with the team since FRC to help with travel to tournaments, help students with community outreach such as doing demonstrations at schools and the County Fair, and help students with fundraising activities which include events and contacting business for sponsorship. More information on FRC and resources for it can be found on the FIRST website.